The first serial Hyundai Solaris was assembled today at the plant Hyundai Motor Manufacturing Rus in Saint-Petersburg, marking the beginning of mass production of Hyundai vehicles in Russia. Stylish design, large selection of options and customization to suit local needs make Solaris a unique offer among C-segment sedans. There has been equipment adjustment in the shops of Hyundai plant and the special quality control committee from Korea has been testing thoroughly all phases of car production during three months since the plant opening. At the end of last week all checks were completed and it was decided to launch mass production. The capacity of the plant is 150,000 vehicles per year. In 2011 the plant plans to produce 105 000 cars. General Director of Hyundai Motor Manufacturing Rus Chun Gui Il emphasized that the start of mass production was a historic moment for the plant and all management and employees of the company had prepared seriously for it for the past few years. The factory works at full production cycle starting with panels forming and car assembling. It is the first enterprise of such kind among foreign automotive makers in Russia. The Hyundai Motor Manufacturing Rus plant is equipped with modern high-tech facilities, which provide high level of automation of the production processes. On a number of stations, for example, in the welding, the automation ratio estimates 85% and more. At the moment more than 1300 people work at the Hyundai factory, many of whom were educated at Hyundai factories in Korea and the Czech Republic to improve their professional skills which are necessary to produce quality products. Within two kilometers away from the HMMR plant there is the Industrial park of Hyundai Motor Company’s suppliers, which includes 7 companies (among them Deawon, Donghee, Doowon, Sejong, Shinyoung, NVH, Sungwoo Hitech). Besides them there are the plants of two more Korean companies (Yura and Il Tube) situated in the North-West region. The investment into the Industrial Park was 200 million dollars. Solaris is powered by the modern Gamma engine, in two types 1.6L or 1.4L DOHC in-line four cylinder gasoline engines that feature multiport fuel injection with CVVT (Continuously Variable Valve Timing). The sedan promises more power and torque, as well as improved fuel economy, in keeping with Hyundai's pledge to be the industry's eco-leader. Solaris is equipped with many specialized features that suit the local weather, road conditions and driving habits. For long and bitterly cold Russian winter, rear heating duct, 4.0 L washer fluid reservoir with a fluid level sensor that warns the driver when a refill is necessary and 60Ah battery for higher cold start performance are offered as standard, and the clearance was increased to 160 mm. Additional options include a heater for the windshield wiper rest area, front seat heaters, side mirror heaters and more. Moreover, for the first time in the Russian market a budget-class vehicle may be equipped with such options as engine start button, keyless access, Bluetooth, and 6 airbags. 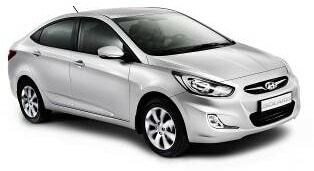 Five variants of Hyundai Solaris will be available in the Russian market: Base, Classic, Optima, Comfort and Family. The price will range from 379,000 to 634,000 rubles for the top variant. Five sets of optional equipment will be also available, costing from 15,000 to 30,000 rubles. The surcharge for metallic paint is 0 rubles.